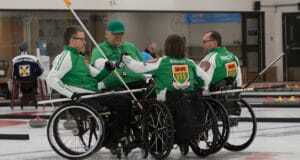 It simply comes down to winning Canada’s Chelsea Carey team from Calgary winning its final three round-robin games at the Silkeborg Sportscentre, and hoping to catch a break or two from teams around them in the standings, in order to clinch one of the six available playoff berths. The Canadian playoff hopes were lessened on Thursday morning by a 9-3 setback to Switzerland’s Silvana Tironzoni, a result that left Carey, vice-skip Sarah Wilkes, second Dana Ferguson, lead Rachel Brown, alternate Jill Officer, team coach Dan Carey and national coach Elaine Dagg-Jackson with a 4-5 record. That leaves Canada tied for seventh behind leading and playoff-bound Anna Hasselborg of Sweden (8-1), Alina Kovaleva of Russia (7-2), Minji Kim of South Korea (7-2), China’s Jie Mei (6-3), the Swiss (6-3) and Japan’s Seina Nakajima (5-4). Canada is tied with Scotland’s Sophie Jackson and Jamie Sinclair of the U.S. at 4-5, but because Canada has lost to Japan, Scotland and the U.S., it would need those three teams to be clearly behind in the standings in order to make the playoffs, as there are no tiebreaker games at the world championship, and head-to-head records are the first tiebreaking method. Suffice it to say, it’s a steep mountain to climb. It was working against the Swiss on Thursday morning, but it went off the rails in the sixth end. It was a 3-2 lead for Switzerland at the fifth-end break, but Canada had the desired last rock in the sixth end. But Carey’s first shot of the end, an attempted double-raise takeout to sit two in the four-foot was overswept, and the raised Canadian stone removed a Canadian counter and was left sitting available for a takeout through a port. Swiss last-rock thrower Alina Pätz made the shot and left Carey only with a hack-weight takeout attempt to score a single point. But that shot had proven tricky during the game, and it did again. Carey was light; the rock overcurled and wrecked on a guard, leaving Switzerland with a decisive steal of two. 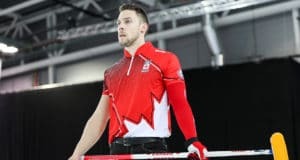 Canada was held to a single point in the seventh end, but in the eighth, another overcurl on Carey’s last stone resulted in the Swiss being able to put it away with a draw for four to end the game early. Team Canada returns to the ice on Thursday at 9 a.m. (all times Eastern) against Russia. On Friday, Canada completes round-robin play with games at 4 a.m. against Sweden and at 2 p.m. against the host Danes skipped by Madeleine Dupont (2-7).